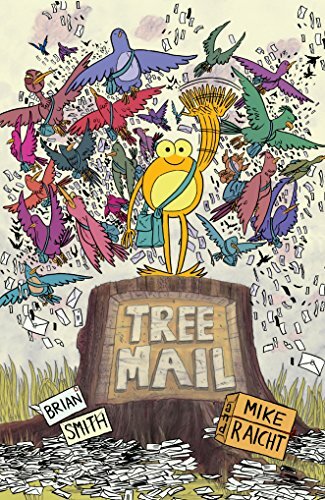 Rudy, a naively determined and enthusiastically optimistic tree frog, joins the ranks of SpongeBob and Dory as Brian Smith and Mike Raicht team up to deliver another fun and adventurous graphic novel. If the reader can tolerate the cheesy offbeat eight-page introduction, which seems out of place with a different design style and tempo, and a message that is not quite alluding to the message of the real story, they will be well rewarded. The true graphic novel structure kicks in, and we are off on a wild tour of the island of Popomoko with both the ugly travails and the coincidentally random good luck that Rudy encounters. Rudy has always wanted to be in the Air Delivery Corps (or ADC), an exclusive brotherhood of sorts that maintains the package and mail delivering service in and around the island. Rudy suffers ruthless taunting and teasing from his fellow tree frogs for holding fast to his dream for one simple reason: He is a frog, and the ADC is for birds. And what a pack of arrogant and irresponsible birds they are. Packages arrive late, ripped, and broken. They are handled without care and delivered without regard to rules or regulations. Rudy, on the other hand, follows the rules, loves the ADC, collects trading cards and action figures of his favorite ADC birds, and cares deeply about connecting packages with their proper recipient. He delivers all the mail flawlessly when the ADC birds think the weather is too poor to fly through. He is on a determined won’t-take-no-for-an-answer mission to be the first frog on the team no matter what anyone else thinks, says, or does. He runs into plenty of opposition from the ADC itself and its leader, Chief Fanny. When Rudy proves to be a perfect delivery frog, the ADC feels threatened and vows to ban Rudy from ever being part of the ADC. Chief Fanny sends Rudy on seemingly impossible missions with the intent to banish him forever. Rudy, to the contrary, sees these assignments as something only the best of the best could ever possibly complete. He is honored by the task. Rudy delivers a package to Bronk Big Foot high up in a mountain cave. When he surprises Chief Fanny by actually completing the delivery, he is immediately sent on an even more improbable assignment to the typhoon vortex region known as the Rhombus. With innocent good will Rudy constantly upholds the values of the ADC while winning friends and impressing customers. He is oblivious to the harm Chief Fanny intends. With such outstanding performances making news around the ADC, Chief Fanny is recognized for her impressive leadership and is promoted to a new post at the Corps of Antarctica. A new chief is instated for Popomoko, and Rudy is officially recognized as a Delivery Cops member. What is there to love about Rudy? Well, everything. He is the spitting characterization of Sponge Bob Square Pants; one can almost hear Sponge Bob’s voice in what Rudy is saying. How can one not be enchanted by him? No matter the obstacle, Rudy sees it from a different and positive perspective. He sees the good in everything. In a world of negative, violent, dark-themed graphic novels, Tree Mail arrives with a different and welcomed message: If you want to do something, don’t worry what everybody says, just do it.